With the newly renovated Frederick P. Rose Hall opening in mid-December, Jazz at Lincoln Center (JALC) will now feature Meyer Sound systems in every performance space at the complex, including a LEOPARD linear sound reinforcement system in the Rose Theater, a Constellation acoustic system in the Appel Room, and an ULTRA Series loudspeaker system in Dizzy’s Club Coca-Cola. Visitors can also experience Meyer Sound technology throughout JALC’s redesigned public spaces, including the Mica & Ahmet Ertegun Atrium and the Ertegun Hall of Fame. The mission of JALC is to entertain, enrich, and expand a global community for jazz through performance, education, and advocacy. Sound is at the heart of Meyer’s commitment to providing the highest quality artistic and audience experience. 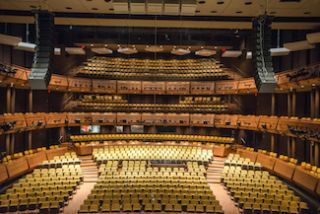 The Rose TheaterSound Associates of New York led the coordination of all Meyer Sound systems throughout the venue, working collaboratively on design with the JALC staff and Bob McCarthy, director of system optimization at Meyer Sound. The overall renovations of the JALC public spaces were designed by Richard Olcott of Ennead Architects in conjunction with Mrs. Ertegun. The iconic Appel Room, with its floor-to-ceiling windows overlooking Central Park and Columbus Circle, has the only Constellation acoustic system in a venue dedicated to jazz. “Now, the optimal listening environment can be tailor-made for each venue and each aural situation through the groundbreaking technology of Constellation,” said Wynton Marsalis, managing and artistic director of JALC. LEOPARD, one of the most successful products in Meyer Sound’s 35-year history, was selected for the 1,233-capacity Rose Theater to provide controlled, even coverage throughout the irregularly shaped room while meeting the needs of the Jazz at Lincoln Center Orchestra. In the 500-capacity Appel Room, Constellation optimizes the room’s acoustics for both the audience and onstage artists, who rely on a virtual “shell” above the stage to enfold them in their performance. Decades of research into exceptional listening spaces informed Constellation's combination of patented algorithms, advanced digital processing, and miniature transducer technology, replacing cumbersome mechanical methods for variable acoustics with the ability to rapidly customize a venue with the flip of a switch. Constellation systems are in use at venues throughout the world including SoundBox at the San Francisco Symphony, Berkeley’s Zellerbach Hall, Finland's Logomo Hall, Norway’s Fosnavåg Konserthus, Russia's Svetlanov Hall, Mexico City's Teatro Telcel, the Alpensia Concert Hall in South Korea, and Estonia’s Nordea Concert Hall. The Lincoln CenterThe refurbished audio system is designed around dual arrays of 12-each LEOPARD loudspeakers and five 900-LFC low-frequency control elements in a cardioid cluster over the stage. Other Meyer Sound components include UPQ-1P, UPM-1P, UPJunior VariO, and UP-4XP loudspeakers, M3D-Sub directional subwoofers, and a Galileo® Callisto™ loudspeaker management system with Galileo Callisto 616 array processors. At the heart of Constellation is a D-Mitri digital audio platform with seven processors, two dedicated to the patented VRAS™ acoustical algorithm. This works in conjunction with 22 ambient sensing microphones and 87 MM-4XP self-powered loudspeakers, six UP-4XP loudspeakers, and 16 MM-10XP subwoofers. Constellation also works together with the room's Meyer Sound reinforcement system of 16 M'elodie® line array loudspeakers, four 500-HP subwoofers, four UPJ-1P VariO and six UP-4XP loudspeakers for center and fills, and a Galileo loudspeaker management system with Galileo 616 processors.